According to your doctor and all the pregnancy health books, you need to eat an extra 300 calories a day in the second trimester of pregnancy and roughly 500 more in the third. All that ‘eating for two’ nonsense is supposed to be a no no but by Jo does it feel like I am. I eat a ridiculous amount of food a day. I don’t know whether to laugh or cry with the amount of food I eat daily, if I’m overeating or under-eating. According to my doctor and midwife I’m well within my BMI and am healthy for my height and at this stage in my pregnancy. A couple of weeks ago, Sam came home from work (after doing night shifts) and sat down to a cold drink, a snuggle on the sofa, some catch up TV when I wanted to get some toast, marmite on toast. I had of course offered to make him toast but Sam wasn’t interested. So off I bopped, made my hot buttery toast smothered in marmite, sat down to eat it, in which Sam thought it was a great idea to try and pinch a slice. Now here’s my problem, I asked before and he didn’t want any, therefore, why now? So, I obviously gave him the evil death stare, seems appropriate, but he was hurt by it. Was I mean? Was I really that horrible? Was I in the wrong not to share food with the father of my child? My eating habits are just insane since finding out I was pregnant. I am hungry a lot of the time, sometimes I feel like I’m feeding a bus load of kids instead of just my bump and I because my appetite in recent years hasn’t been as good as it used to be. So eating as much as I have, has in a sense been a godsend (I needed to put on some weight for my own health as much as for mini me’s) and to be able to be flexible with what I’m eating, I can have most things apparently but a lot of things are off limits. I’m not happy that the only way I can eat two of my most favourite things in the world unless cremated (steak) or boiling hot (Brie) so have avoided them all together. Lunch: soup or a sandwich or something bigger, depending on how hungry I am or how much exercise I’ve done in the morning! I consume a lot of tea (decaf) throughout the day, a glass of orange juice, a glass of squash and really do try to drink 2 litres of water a day. 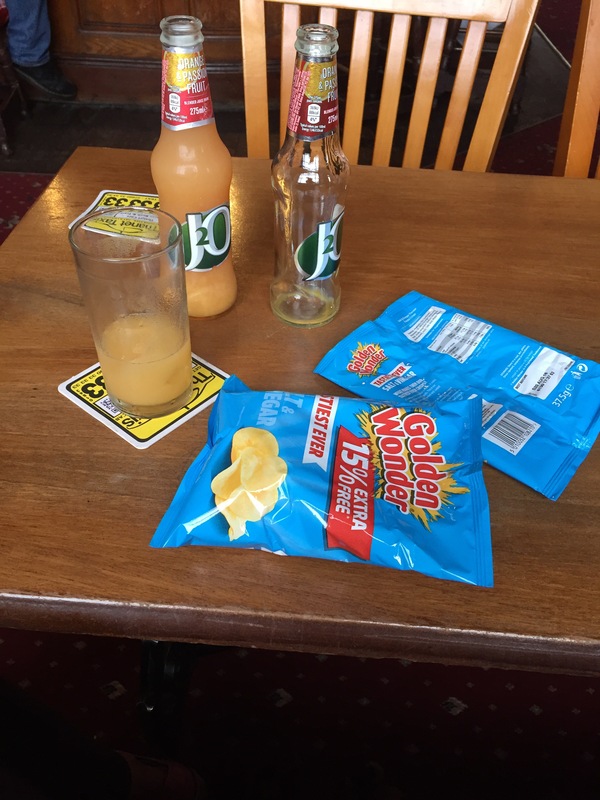 Going to the pub with Sam generally means in a small sitting I’ll consume a large amount of Salt & Vinegar crisps, a lot of Orange & Passionfruit J20, pints of water poured over ice with a slice and trying not to eat anyone that gets in my way. I won’t share my food anymore, I will be able to consume it all. Just let me have a bit of a breather, all of it will be going in, at some point. Even with a Indian, I’ll happily sit there and have the bread for a short while after. I just can’t help it and no one likes wasting food! Once my morning sickness ended and I entered into my second trimester, putting on weight and actually eating something and keeping everything down was like a dream come true. Out of nowhere came this insatiable hunger and it was amazing. Now that my little one is growing her need for food is what’s making me eat so much. Without a doubt my body is playing catch up for all the days I spent being sick, whilst also being sensible. Being pregnant should be driving you to drink more water. It’s really important during pregnancy that your body absorbs essential nutrients into the cells and transports vitamins, minerals and hormones to the blood cells. As your body is working double the amount of time making your baby, you need liquids more than ever. I’ve tried to drink 2 litres of water a day. I struggle but do drink squash to help get rid of the blandness that sometimes comes with water. Being near the seaside, Ii definitely try and drink more water, it’s easy to forget, but you’re not just keeping yourself hydrated anymore, you mini you needs it too. It’s easy to say you’ll stick to eating three times a day but believe me you won’t. Once that morning sickness has gone, you’ll eat and eat and eat. Sometimes even wondering where it’s going if it’s not all going to your baby. Instead of eating a huge breakfast, spread out your meals often throughout the day. Overeating in one sitting can make you feel a little sick and your tummy feel stretched, which is an unpleasant feeling! If you get a craving at 2am, feed your hunger, hunger pains and mini kicks from the little one are irritating, but if you’re hungry, feed yourself a snack. You may have just eaten a big breakfast and have set off on your big day out, but you burn through that food a hell of a lot quicker when you’re pregnant in comparison to when you’re not. Nothing is worse than being stuck on a train with 20 minutes to go till the next stop when you’ve got the munchies and an over-active baby using your insides as a basketball court and nothing to nibble on. So make sure you carry with you some yummy treats around with you. Raisins, granola bars, breakfast bars or anything that tickles your fancy that’s there to keep you and your little one fed when hunger strikes. As tempting as it is to now eat as much as you want of McDonalds, Burger Kings or KFC, it’s a fast food that should be kept as a treat not an everyday luxury. You want to fill up not fill out and pile on the pounds. You may hear people saying you are now eating for two, but make sure you keep an eye on how much weight you’re putting on. Temptation to naughtiness should always be followed by some exercise. Those middle-of-the-night cravings aren’t going to go away if you ignore them, so make sure your fridge and freezer is stocked and your hunger is fed. Anything I’ve missed out? Comment below and I’ll add them here. Next Post We Found Dory and loved it!